I'm not a professional photographer, but I've made $35,000 selling my photos online. In this blog post and video, I'm going to go through exactly how I did it, which sites I've tried, which ones worked, which ones didn't, as well as which ones I think are maybe the best sites in the coming year. For the past seven years, I've been selling my photos online. This is how the $35,000 breaks out year over year. You can see that when I started here my first year, I only made about a thousand dollars. And then it continued to increase over the first four years until 2015 when I reached a high of $7,000 a year. And there's a bit of decline that starting to rebound now. In this chart, you can kind of see why it went up and then went down. 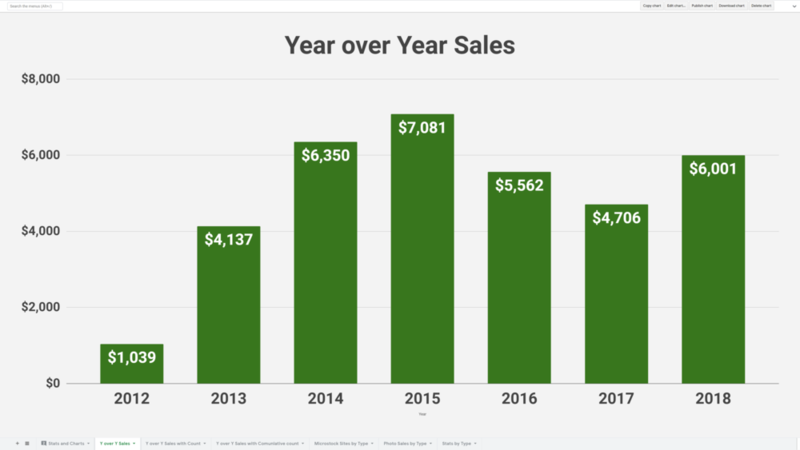 The green shows, my revenue and the red shows, how many photos I posted each year, so you can see my first year I posted about a hundred photos, uploaded them to different sites online and then the second year I was very motivated. I did over 240 photos. These are 240 fully processed photos that I uploaded to multiple sites. Now in November of 2013, my wife and I had our second child and the time that I had to go travelling and take photos as well as process those photos went down. So you can see in 2014 I only uploaded about a hundred photos. 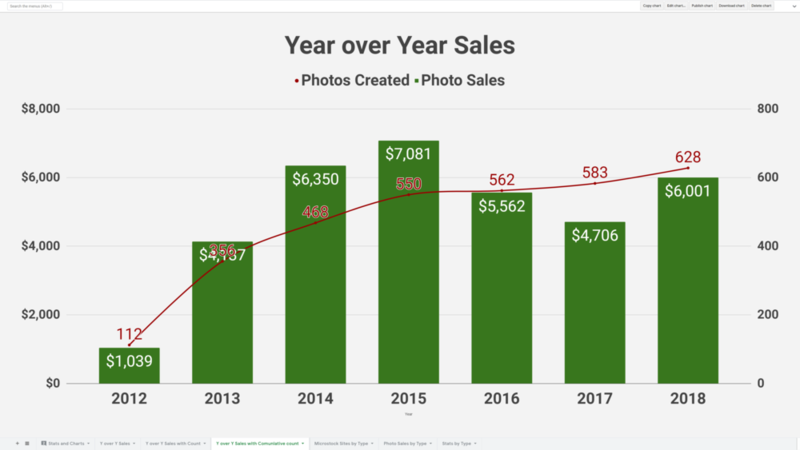 Now despite uploading fewer photos, my revenue kept going up in 2014 and even in 2015 even though the number of photos that I posted went down. Now in 2016, we had our third child and I just really didn't have much time to travel and do photography. So 2016 and 2017 I really didn't put as many photos and that's why you can see here that my revenue went down for those years and over the past year, year and a half in 2018 I started to post a bit more and it started to go back up. So you can see that once you upload your photos, you can keep getting ready for you from them, even if you're not posting regularly. But it will go down slightly year over year. This way I've shown at the red line is the cumulative photos. So you can see how I photos grew over time. And right now I've got about 600, good photos posted across many sites across the web. Now if you look at the types of sites that I upload to, you can really break them into three main categories. The first is direct stock, this is my own website, www.souvenirpixels.com. I used to host it on Squarespace but currently hosted on SmugMug and anybody can go on there and buy prints and photo licenses. Typically they'll see my photos on social media and then on my social media it links back to my website where they can just go on and purchase licenses. I also have uploaded my photos to a lot of print on demand sites and I've tried it a bunch of them but the only one that I've really had great success with is Fine Art America. So most of my photos are on Fine Art America and I've made some money from those as well. You can see here about 8%, but the vast majority of the money that I've made selling my follows online has been from microstock sites. I've tried a lot of different sites, about 23 of them in total and that really makes up the majority of my revenue. So we're going to look at which sites and a bit more detail you can kind of see in this pie chart. So this is kind of breaking out of the revenue from all the sites. So you can see by far this pink bar here is Shutterstock and they are by far been the best site for me for selling my photos online. I had a very good run with Shutterstock, if you typed in landscapes and Shutterstock, I had a photo on the main page, if you typed in Canada, I had multiple photos on the first page. So I did really well a year over year and month over month on Shutterstock. Now over the past six months, the search algorithm, the scene to change a little bit and my sales have gone down a little bit. The second one here is 500px. Now, 500px was a photo sharing community before they started selling stock. And I was involved in the community before it was selling a stock. So I hit a lot of photos that were highly ranked and when they started selling for stop selling photos for stock as well too, I made quite a bit of money when they first started out. Now there's been a lot of changes over at 500px, they were purchased by another company. Now all the sales are through Getty and I just really don't appreciate the site as much as I used to. Number three is PhotoDune. This site has really only earned me a lot of money in the last couple of years. The first couple of years it was very low. And last two years really it's being very high. So I see Photodune surpassing 500px this year. And then the fourth one is Adobe stock or Fotolia. Fotolia was an independent stock site and then Adobe bought them and it turned it into Adobe stock. So I had my portfolio on Fotolia and they did fairly well there and now has moved over to Adobe stock. Now, I hope that didn't come across as bragging, but I had no idea when I started selling my photos online that I would make $35,000 from them. Really my goal of doing this was so that I could buy more cameras and lenses without taking it in my family budget and I achieved that so I am pretty happy with my decision to upload files to Stock sites. Let me know in the comments about your experience with selling photos online.